They talk a lot in footy about leaving your guts on the field. 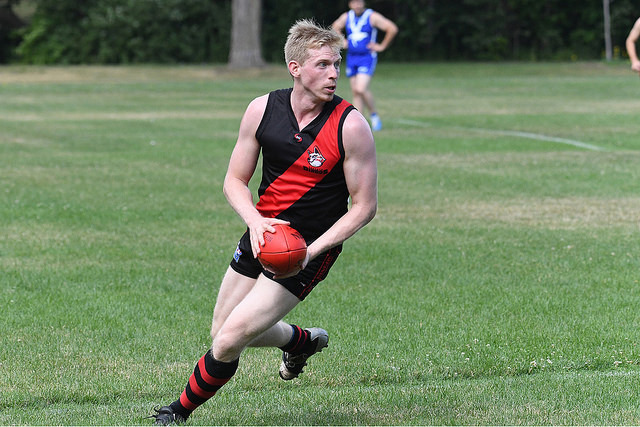 So it was that veteran Irishman Gary Conlon found himself removing Raccoon entrails from an otherwise picturesque Humber College South field before the Toronto Dingos recent clash with the Etobicoke Kangaroos. These two teams already faced off once this season, with the Roos running away with the honors 16-16-112 to 5-6-36. Although there is still plenty of footy left to play in the AFL Ontario things are starting to solidify up and down the ladder with any given match having the potential to make or break the finals run of a number of teams including the Dingos. It was with this in mind that the Dingos came into this one looking for a better showing than their earlier matchup with the Roos. The Roos came out firing as usual looking for their primary target up front but the Dingos backs led by Tim Indian and Ben Moller weathered the early storm, going into the first quarter break down 2-7-19 to 1-7-8. In the second quarter Steve Gordon stepped into the ruck and there was a rise in intensity across the ground from the Dingos, led by Michael Ladd out of the middle. In the meantime Canadian Lynden Evers moved in as an additional target in the forward line and was among the best. The Dingos again did a good job of finding Rob McNaughton up front in this one although goals again came from a variety of sources including returned alumni Denis Cormier and Irish sensation Sean “The Big Show” O’Reilly. Things got a bit chippy for a while but a quick yellow card each way just before the break seemed to settle things down, with both teams realizing this one was going to be an arm wrestle. At half time the Dingos held a narrow lead 5-4-34 to 4-8-32. The tight nature of the contest persisted through the break, with both teams struggling to get majors on the board in the third quarter but the Roos having the better of the possession. At three quarter time the lead had flipped and the Roos were up 6-13-49 to 6-5-41 with the Dingos still right in the thick of it. The Roos were having none of it though and showed where the level is set coming out and overpowering the Dingos in the fourth, running out 9-17-71 to 7-6-48 victors. The Dingos will take away that they showed solid improvement over their previous clash, but still have work to do to make a solid finals run.